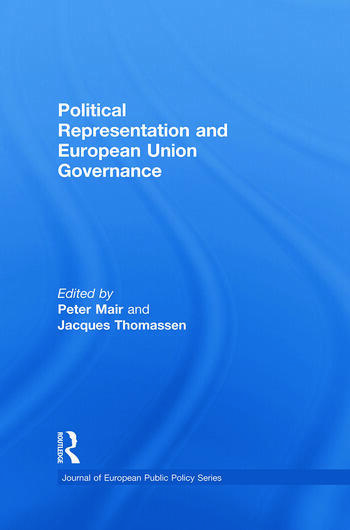 This book confronts and discusses different conceptions of political representation with respect to their application to the system of multi-level governance in the European Union. Political representation is an essentially contested concept. Its meaning has evolved with the development of representative democracy at the level of the nation state, and normative theories of political representation often evolved as a reflection on developing practices rather than the other way around. Since the EU is not a conventional nation state, and since the effectiveness and legitimacy of classic notions of political representation at the level of the national state has also become a matter of dispute, the EU has become a playground for the development of alternative or additional conceptions of democracy. The contributions to this volume evaluate these alternative conceptions with regard to both their effectiveness and their legitimacy, and combine both conceptual and empirical analyses. Peter Mair is Professor of comparative politics at the European University Institute in Florence, Italy. Jacques Thomassen is distinguished Professor of politics at the University of Twente, the Netherlands.